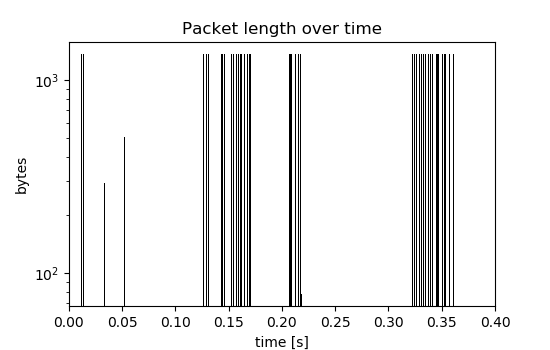 A flow is viewed as a signal of packets over time. This signal is then transformed in a series of bursts. A burst here is defined as the set of packets that were recorded within a certain time window of each other. (Note that this is not a regular binning of the time dimension as a burst can be arbitrarily large in the time dimension as long as the next packet arrives within that window.) Each burst corresponds to the sum of bytes contained in all the packets aggregated into that burst. The total number of bytes in each burst for a given flow is then used to characterize this flow. 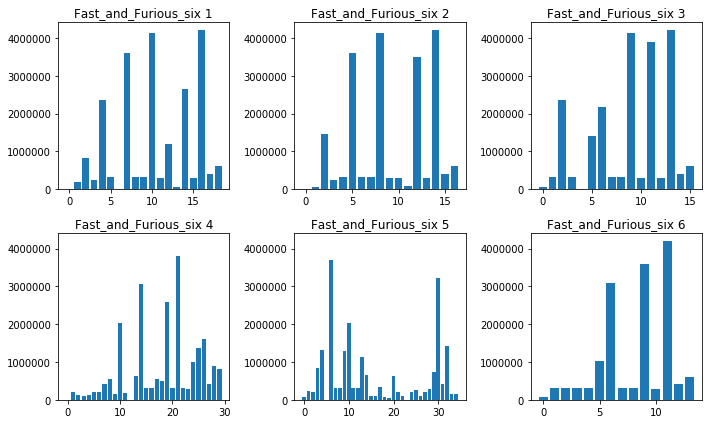 Plots like this can also be generated for any given flowfile using the fpsGplt and t2plot scripts. More information on this can be found in the documentation or in the traffic mining tutorial. In order to identify YouTube flows in a larger PCAP traffic dump, the Server Name Indication (SNI) TLS extension is used. The sslDecode plugin for Tranalyzer makes the server name available in the sslServerName column in the flowfile. We need the path to the Tranalyzer directory, and to the PCAP files that we are going to be using to create our model. # Configuration: Adapt to your system. sslDecode to identify YouTube flows. We can use t2conf to configure the plugins to our liking. For this tutorial, we set the minimum time window that defines a burst to 50ms and the number of packets to analyze to 200. To build Tranalyzer and the plugins, we use the included autogen build script. Given a flowfile, we now need to extract a list of numbers that correspond to the total number of bytes in each burst. For this, we run a small (T)AWK script and some basic postprocessing that we execute using tawk. We extract the bursts for several PCAPS in parallel to speed up the process. Each thread is given a PCAP file, runs Tranalyzer, extracts the bursts and stores them into a unique location per thread. chunk_size = max_pcaps # `chunk_size` must divide `max_pcaps`. Using these building blocks, we can now write a function learn that, given a list of classes, fetches the corresponding PCAP files from the user-defined path at the top in this script, extracts the bursts for all PCAPs of each class using Tranalyzer, and stores the resulting features in a dictionary. We persist this dictionary to disk so that we can call this program again in test mode, give it a new PCAP, and get the video title that most closely matches the unknown sample, given the model. Note that here, we are storing the bursts in a list rather than a set (as in the paper). This helps us understand the data better when exploring it visually later on. It does not have an impact on classification accuracy. # list() to preserve the order of the bursts and produce more meaningful plots. 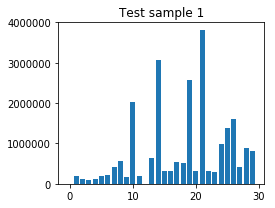 To classify an unknown sample, a simple nearest neighbor approach is used. A video is represented as a set of integers, each representing one burst in the signal. The unknown sample is classified to the video title of the known sample that shares the most bursts in common with the unknown sample. To understand our data better, we can plot the extracted bursts for each sample and examine them side by side. # Optional: Filter out audio bursts <=500K. # Optional: Sort for alternative visualization perspective. We first train our model using the training data. Afterwards, the program can be run in test mode and will output the top matches for a new unknown encrypted video stream sample. # invoked in "test" mode. 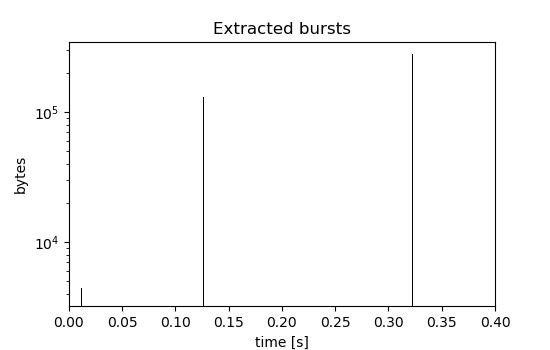 plot_bursts(list(bpbs[c]), c) # Plot bursts of whichever class happens to be the first. Done building model, ready to test now. We wrote a short python program to build and train a nearest neighbor model to classify encrypted YouTube video streams using Tranalyzer. Download the jupyter notebook for this tutorial here. If you have any questions or feedback, please do not hesitate to contact us!